Potential large-scale carbon capture and storage (CCS) in Europe requires the transportation of large amounts of CO2 to storage sites. In order to reduce both construction and operational costs to a viable level, it is vital to do continuous research on the design of CO2 pipelines, simulation tools, the properties of CO2 mixtures and models for CO2 flow. A recent NORDICCS report highlights where the knowledge gaps are. Before being pumped through a pipeline, the CO2 gas will be compressed to a high pressure and a liquid-like state in order to make it easier to transport. CO2 captured from industry will typically contain other molecules as well, such as nitrogen, oxygen and methane. The behavior of the CO2 mixture can change significantly in response to even very small amounts of these impurities. 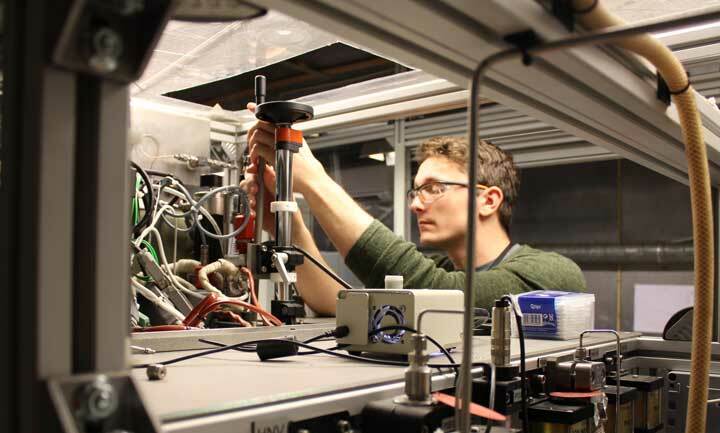 Snorre Foss Westman makes adjustments on a test rig for measuring phase equilibria (photo: Sigurd W.
When pumping CO2 through a pipeline, there will be some friction that causes the pressure to drop. If the pressure drops below a certain limit, the liquid-like CO2 mixture starts to boil and creates gas bubbles. These gas bubbles can dramatically increase friction and the pressure drop, thus reducing the efficiency of pumps and other equipment. This chain of events makes it necessary to predict both the pressure drop and at what pressure gas bubbles start to form. If the pressure drop cannot be predicted in advance, more pumps will have to be added to keep the pressure up, thus increasing costs. The friction also depends on the viscosity of the fluid, so in order to predict the pressure drop, we need new and better viscosity measurements for CO2 mixtures. There is also limited experimental data on the pressure at which gas bubbles form (the bubble point pressure) for CO2 mixtures. Similarly, if the pipe is emptied for e.g. maintenance, the pressure will drop and the liquid CO2 will start to boil and create CO2 gas. This will also cause the temperature to drop. The pipeline steel cannot withstand too low temperatures, so it is important to predict how low the temperature will be during the emptying of a pipe. This requires good thermodynamic models to relate temperature and pressure for CO2 mixtures. In a CCS infrastructure, there will be a price per ton of CO2 . But how do you measure the weight of CO2 flowing through a pipeline at all times? A common way of measuring the weight is to measure the pressure and temperature of the mixture, and then use a thermodynamic model to calculate the weight (or density) based on pressure and temperature. If the industry cannot correctly predict the density of the CO2 they need to store, they might have to pay more than necessary to have it transported and stored. If the industry cannot correctly predict the density of the CO2 they need to store, they might have to pay more than necessary to have it transported and stored. The same issue faces petroleum companies that sell natural gas today. There is a lack of experimental data for density for many CO2 mixtures, so more experiments are needed to fill in the gaps and develop more accurate thermodynamic models. Existing simulation tools for pipelines are typically aimed at flow in nuclear reactor cooling systems or oil and gas pipelines, and have only limited support for CO2 and CO2 mixtures. These simulation tools are also limited by the mentioned lack of experimental data for viscosity and thermodynamic properties of CO2 mixtures. More research into properties of CO2 mixtures and models for CO2 flow can contribute to improving the design of CO2 pipelines and reduce both construction and operational costs. More research into properties of CO2 mixtures and models for CO2 flow can contribute to improving the design of CO2 pipelines and reduce both construction and operational costs.